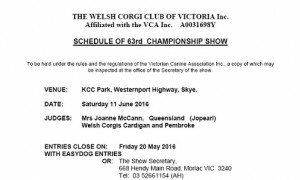 The Welsh Corgi Club of Victoria is proud to release the schedule for the June 2016 Championship Show. This show will be held on Saturday, 11th June 2016 in conjunction with the Working Dog Show. The Judge is Mrs Joanne McCann (Jopearl, QLD), and entries close on Friday, 20th May 2016. This Championship Show will be held in place of our Open Show, and is the first show that we have offered online entries for. You can enter online with Easy Dog Entries, or by mail. The full June 2016 Championship Show Schedule (PDF) and trophy list is available as a PDF document.